We all have those days where things maybe not going our way. The days where you wake up grumpy, you get out of the wrong side of the bed. Bad news might upset you and you need a distraction. Stress at work, kids playing up and the general stresses of life can all affect your mood. 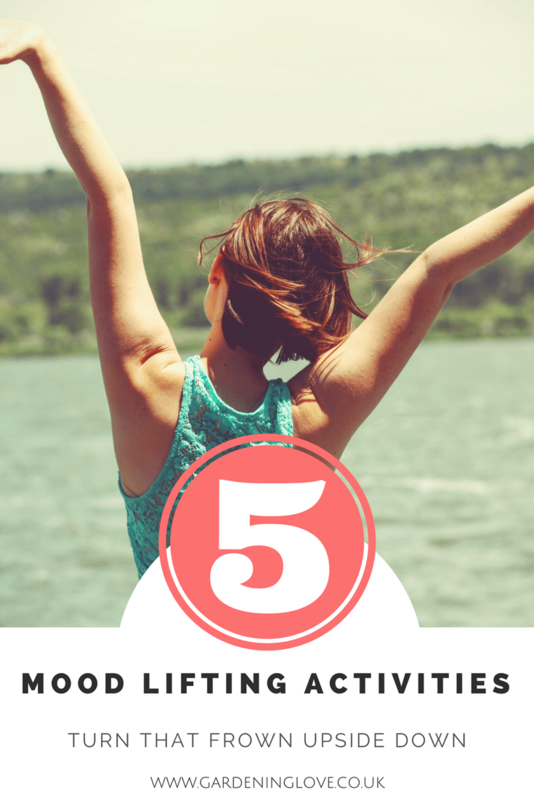 A spare 5 minutes is all you need to turn that frown upside down and get your day back on track with a more positive mindset. 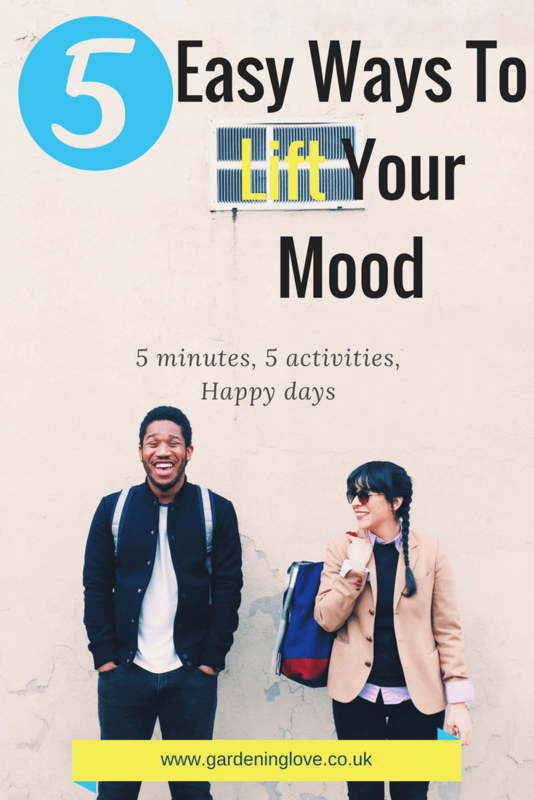 Try these easy mood lifting activities to improve your mindset and your day. Buy yourself some flowers or a house plant. Dont wait for another to buy you flowers, you don’t need a special occasion to treat yourself. You are worth flowers every day. Their beauty and colour will light up your room and your mood. Easy to care for houseplants such as aloe Vera, money plants, give you something to care for and connect you with nature. This is good for your soul and overall wellbeing. Mood lifting ecotherapy right there. Stand in your garden for 5 minutes. If you have a nice garden that’s great. Take the time to admire its beauty . Breathe in and out deeply, taking in your surroundings. If you don’t have a garden as such or your not into gardening then simply looking at green grass for 5 minutes can benefit and calm you. Green is a therapeutic colour, known for its calming effects. Dig out your photo albums. Looking back through happy times with friends and loved ones is a sure way to lift your mood. It is easy to forget the little things, and there is nothing like a photograph to capture that small moment of time. Imagine yourself back there, how you felt in that moment. I also like to use an app to regularly print photos from my smart phone. I think we are all guilty of storing our special memories on our devices these days. But you can’t beat holding the photo in your hand. Reconnecting and reminiscing is a sure way to lift your spirits. Take a walk around your home. Use this time to look through your belongings and the home that you have created. Take this time to appreciate all that you have and express gratitude for all the wonderful things that make your home special. We often forget how lucky we are. Gratitude practiced daily improves our wellbeing and attracts more to be thankful for into our lives. Take part in a mindful activity. Some great ways to live in the moment are doing a jigsaw or a colouring in book. Focusing on that task helps to keep your mind focused on the present moment. Concentrating on a relaxing activity helps to lift your mood by not thinking about the past or worrying about the future. Even 10 minutes a day can give your mind a rest, improving your wellbeing and mental health. If mindfulness is a new idea to you then you can check out my easy beginners guide HERE. It’s so important that we take the time to look after ourselves and our mood. Your mood and mindset can make or break your day. Check out these motivational quotes to help your day tick along just right ! Let me know how you get on in the comments below? 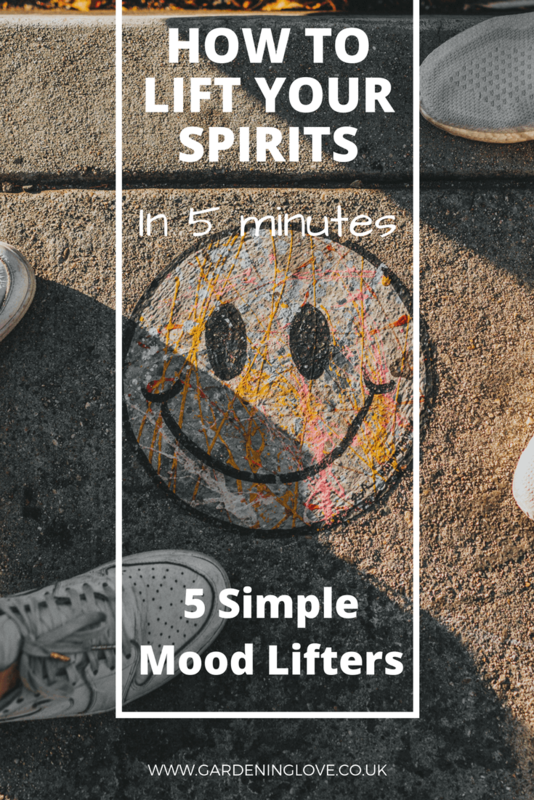 Do you have particular mood lifting activities that work well for you ? Please share your thoughts . Glad you enjoyed ! Thanks for stopping by. Small activities such as standing in your garden can really make the difference. Great post! Im a big fan of flowers, plants, mindfulness and exercise (in addition to healthy self care) as important ways to lift the mood. Love this post! Thank you Anita, glad you enjoyed ! You can never get over how much they have grown ! Memories are so precious. Such good ideas! Simple and easy to implement. Practicing mindfulness is so important in these busy times. Great post! Great ideas!! I buy myself flowers from the grocery store once a month. I love having real flowers around the house. It does make me feel better. I also like to sit or walk outside around my house, being outside helps me so much. Thanks for sharing your ideas. I’m big on walking! Love just kind of spacing out for a while and letting my mind and body wander. Great tips!